You may now log in to your UH Press web account. Customers may experience problems logging in to their UH Press web accounts while we move to a new server. Our apologies for the inconvenience. Please check back periodically. Eleanor Nordyke in Hana Hou! Eleanor Nordyke is featured in the January issue of Hana Hou!, the in-flight magazine of Hawaiian Airlines. 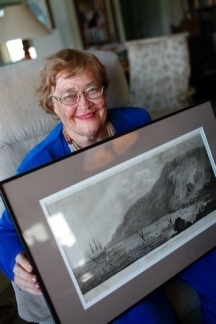 Ms. Nordyke is the author of the recently published second edition of Pacific Images: Views from Captain Cook’s Third Voyage and the longtime bestseller The Peopling of Hawaii, both available from UH Press. Photo: Charles E. Freeman/Hana Hou! Saturday, January 30, 1:00-2:00 p.m.: Barnes & Noble, Kahala Mall, phone: 737-3323. Catholicism, like most world religions, is patriarchal, and its official hierarchies and sacred works too often neglect the lived experiences of women. In Mary, the Devil, and Taro: Catholicism and Women’s Work in a Micronesian Society, Julianna Flinn looks beyond these texts and reveals how women practice, interpret, and shape their own Catholicism on Pollap Atoll, part of Chuuk State in the Federated States of Micronesia. She focuses in particular on how the Pollapese shaping of Mary places value on indigenous notions of mothering that connote strength, active participation in food production, and the ability to provide for one’s family. Nationally acclaimed author Jon Shirota returns to Maui this month! Shirota’s 1965 classic Lucky Come Hawaii, the first novel by an Asian American writer in Hawai‘i to become a national bestseller, was recently issued in a newly revised edition by Manoa: A Pacific Journal of International Writing and University of Hawai‘i Press. Thursday, January 14, 7 p.m., Maui Okinawa Cultural Center: Jon Shirota will give a free public talk hosted by the Maui Okinawa Kenjin Kai (MOKK). Please RSVP by calling MOKK at 808-242-1560. Friday, January 15, and Saturday, January 16, 7:30 p.m., McCoy Studio Theater of the Maui Arts and Cultural Center: Kumu Kahua Theatre presents Shirota’s latest play, Voices from Okinawa. For more information, call the McCoy box office at 808-242-7469 or write boxoffice@mauiarts.org. Saturday, January 16, 2-3:30 p.m., Borders-Kahului, Maui Marketplace: Shirota will be signing copies of his books. For more information, call Borders-Kahului at 808-877-6160.